The Wichita County Sheriff’s Office is now hiring for Detention Officers. 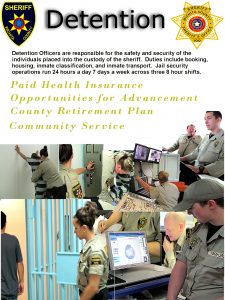 This position involves maintaining the safe and secure care, custody, and control of incarcerated adult male and female inmates. If you have any questions feel free to contact us at 940-716-8678. The Wichita County Sheriff’s Office is looking for the best and brightest individuals. Those who have the aptitude and sense of commitment, those who want to help their community, and those who want to make a difference. The Wichita County Sheriff’s Office’s goal is to provide the highest level of professional public service to the wide range of ethnic and culturally diverse groups that make up Wichita County. 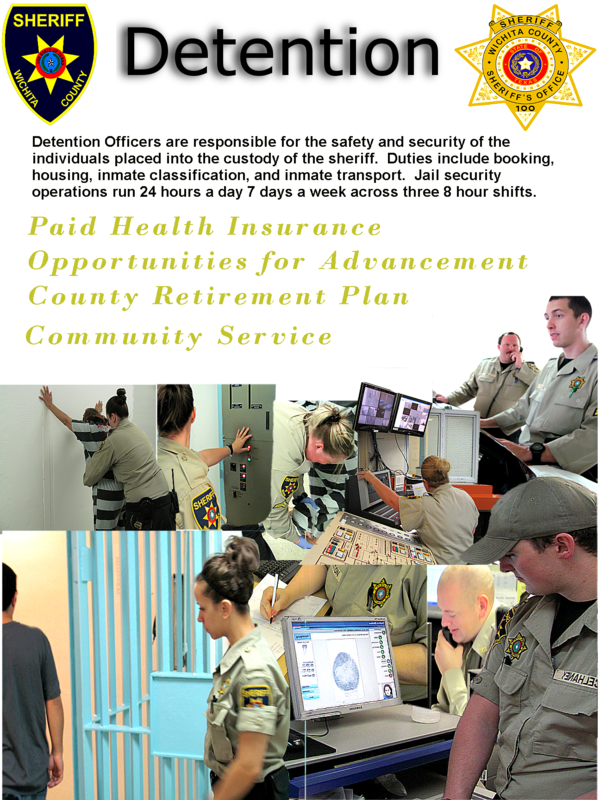 A Career with the Wichita County Sheriff’s Office offers; challenge, excitement, teamwork and job satisfaction, opportunities for special assignments, and career development, opportunities for promotion, and competitive salary and benefits. Citizenship: U.S. citizen or a Naturalized citizen. Civilian applicants must be able to show proof of residency or a work visa. Criminal History: In general, no record of conviction for any offense above the grade of Class B Misdemeanor, no convictions for Class B Misdemeanor within the preceding 10 years, must not have ever been on probation for any offense above the grade of Class B Misdemeanor. Valid Driver’s License: Field Deputies and Detention Officers are required to maintain a valid Texas Driver’s License. Each applicant seeking employment with the Sheriff’s Office must successfully complete a multi-step hiring process as outlined below. If the steps listed above are completed successfully and the position is offered is accepted, the applicant will receive a starting date and complete in-processing. Applicants MUST successfully complete each step to progress to the next step in the hiring process.